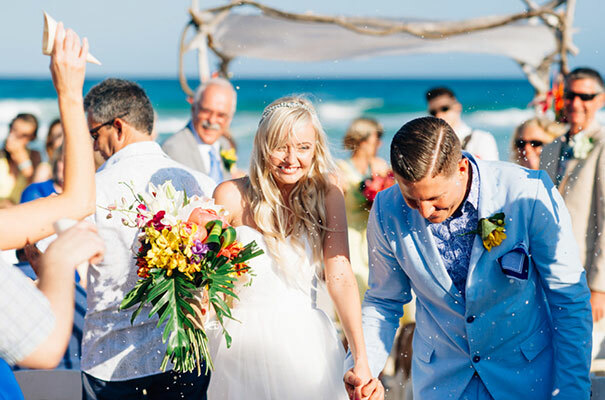 The beach had always been a huge part of Lisa and Jai’s lives, so when it came time for their wedding, choosing the venue was a no-brainer. £We are renowned for having great parties so we definitely saw this as an opportunity to throw the biggest and best party of our lives, says Lisa, whose special day began with a morning surf and ended with dancing under the stars in her Jennifer Gifford Designs gown and Bo & Luca headpiece. Opting for a bohemian vibe, the couple encouraged friends and family to go barefoot (or in the bridal party’s case, rock Foreversoles), sip tropical cocktails, and take full advantage of an epic tipi photobooth. £It was really important to us that our guests felt relaxed and a lot less formal than a traditional wedding”, says Lisa who felt that photographer Jess Jackson was the perfect fit. 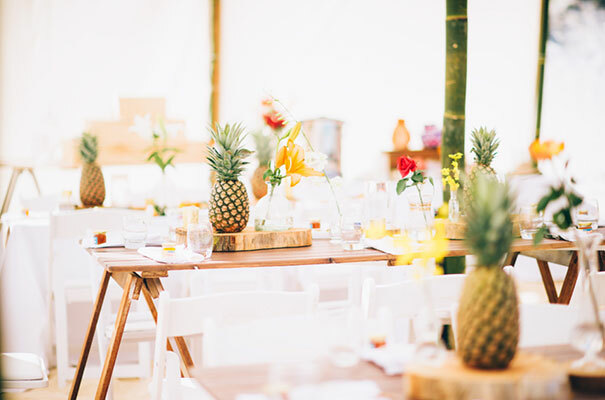 From bright blooms and pineapples, to twinkly lights and a bamboo marquee, the perfect decor was key in creating a fun-filled atmosphere at this wedding which was brought to life by Stradbroke Island Events. On top of all their decorations, Lisa and Jai wanted £the best celebrant on the face of the planet. Known for his ninja photo-dodging skills, Paul Voge was essential in helping with Lisa and Jai’s vows since they believe love occurs between two people rather than just a man and a woman. £I think it’s important to acknowledge in front of all the people that you really care about in your life that you truly love this person with everything you’ve got, explains Jai. CREDITS Photos Jess Jackson // Bridal gown and head piece Jennifer Gifford Designs // Shoes Forever Soles // Flowers Flowers by Serena // Rings and earrings Anthony’s Fine Jewellery // Bridesmaids dresses The Dainty Yard via Etsy // Groom and groomsmen suits ASOS // Shirt and pocket square MYER // Ceremony and reception Stradbroke Island Events // Catering Look Beach Bar Cafe and Fire ‘N’ Dough // Cake Gillian Bell Cake // Cake topper Flowers By Serena // Stationery designer Very Graphic Designs // Hair LaLa Hair Studio // Make up Stradbroke Island Beach Hotel Day Spa // Celebrant Paul Voge // Photo Booth Stradbroke Island Photography // Flower Girl Tutus Nan’s Garden.